Temperatures range from the mid-70s in winter to the mid-80s in summer. Annual rainfall averages 45 inches and trade winds are nearly constant. Low humidity year-round. Silken sands. Captivating coves. Secluded shores. 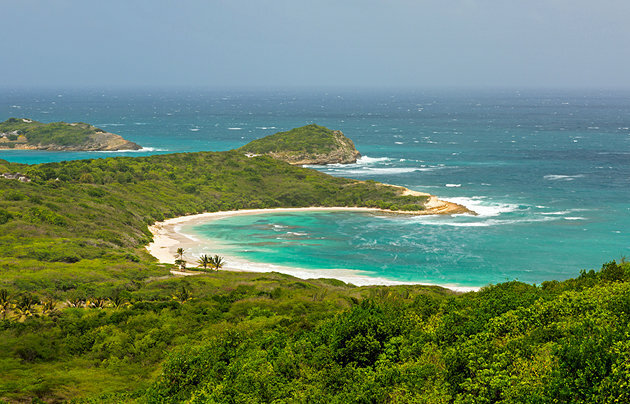 There are 365 beaches in Antigua, most located on the island’s calm, protected Caribbean side. Tucked along the bays of the island, Antigua’s beaches are some of the most pristine in the Caribbean. Warm, steady trade winds, a complex coastline of safe harbors, and a protective, nearly unbroken wall of coral reef make Antigua a delight for sun worshipers and watersports enthusiasts. Located in the middle of the Leeward Islands, Antigua’s weather is ideal with less than 45 inches of rainfall each year, making it the sunniest of the Eastern Caribbean Islands. On the east coast, Half Moon Bay and Long Bay are both known for unforgettable snorkeling and diving. Dickenson Bay and Runaway Bay are located on the northwestern coast and are the place to go if you want the full beach experience. Galley Bay attracts surfers during the winter. The four crescent beaches at Hawksbill are also highly regarded. The perfect end to any day awaits with spectacular sunsets from Fort Berkeley and Shirley Heights, where you can see far out over English Harbour. A visit to Nelson’s Dockyard at English Harbour is a delightful experience with its mix of shops, restaurants andEnglish taverns.